I'm a lot of things (many of those things words I really shouldn't use), but disorganized is near the top of that list. If you look at my card collection, you would think that is not true. I do a pretty good job keeping all my cards together. Dupes are organized by team, unless the set is from the current or past year. Those I keep in a box to easy find for people's want lists. I have index cards with blog names on them so I can sort cards I will send to people into a tidy bin. I have too many binders to count, more than half empty in preparation for some set or custom collection to fill them up. I have spreadsheets to keep track of team sets, card sets, bloggers addresses. It's all looks perfect. Hit "K" in one folder and all my pictures appear together. However, this is pretty far from the truth. I have lists to keep track of what needs to be done, but it I don't look at the list, I forget. I'll leave the house for a specific item and come home with many things EXCEPT that specific item. I forget names all the time. I forget events coming up. I forget what my wife asked me to do 5 minutes ago. My mind is extremely unorganized, and if you looked at my desk or some of the drawers behind me, you will see that it true. Which makes this post today troubling, as I have no idea who sent it. It's not that I misplaced a note within, or the address. From the moment I opened it, I was lost. Who sent this? I love dropping envelopes on people out of the blue and receiving the same. But I feel like I forgot to track and address and cannot give proper thanks to this user. So if you sent a plastic case of about 30 cards a couple weeks back, speak up. It was filled with lots of wonder 90's cardboard. I love it because even without sorting the card, I can tell some that are missing from the Sox box - these three for starters. With the right knowledge by the voters, this will be an image of three HOF members next year. See all this cool cardboard? No idea who it came from. 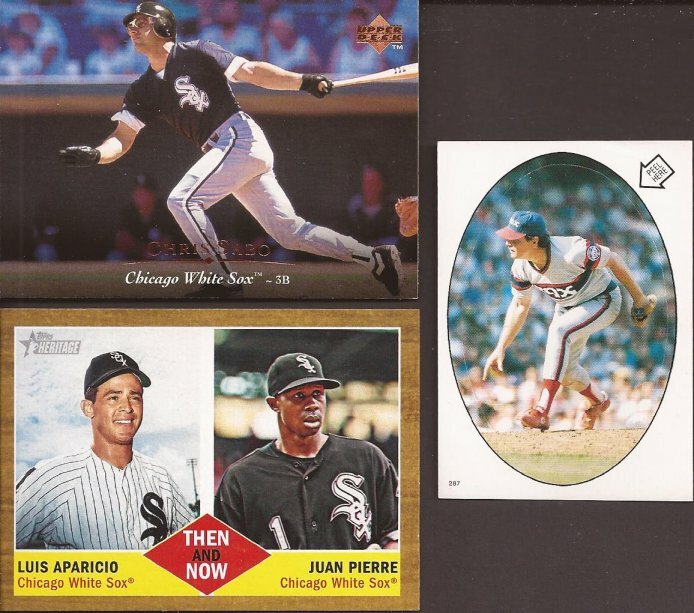 Not sure how Topps thinks Juan Pierre and Luis Aparicio are similar players. What do I know, right? Cuz I certainly don't know who sent me all these cards, but thank you just the same. Don't forget to add you name next time you want to send me cards from out of nowhere. Dig the Seaver and the Sabo cards. However, 'twas not me who me who sent this. I think I did it. Label must have fallen off in transit. Glad the cards arrived safely. Love the Faith No More. I wore out that CD in middle school.